As freezing temperatures bring much of the country to a standstill, Ireland's cold snap seems set to continue for the coming days at least. But is it possible that this cold spell is the worst in Europe? 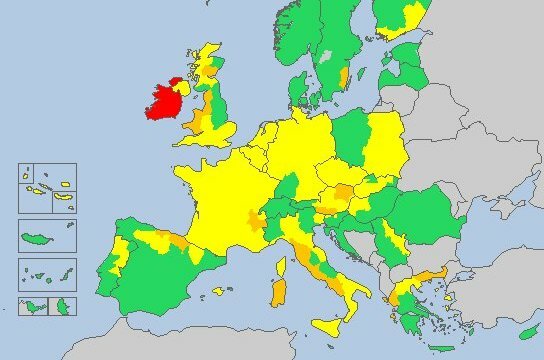 The map opposite was taken recently from the European weather emergency service and rates the severity of snow storms across Europe. The scale of severity goes from green (safe) through to yellow and orange (potentially dangerous) to red (very dangerous). Could Ireland's weather really be the worst in Europe and if so why does it improve dramatically when you cross the border into Northern Ireland!